One of CAOs finest and most famous blends. 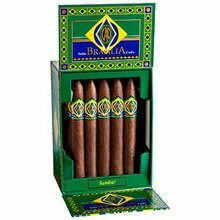 The Brazilia has come to be known as one of the strongest cigars on the market. 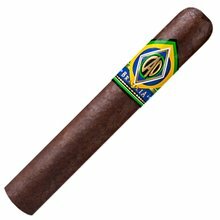 With a dark and oily Brazilian wrapper combined with vintage Nicaraguan filler, this 60 ring gauge made a great edition to CAOs World line. Packaged in a box of 20. Pretty good cigar. A little overrated, it's not amazing. But it's a decent smoke. Lousy cigar. Everyone out of the box has had a poor draw. Halfway through each stogie, it starts tasting like a .50 cent cigar. Will stick with Partsgas Black. One of my favorite CAOs. Great rich flavors and aroma. No draw issues for me. Good construction. Just an all around good smoke. This cigar has been my standby for years and I love it right out of the box. However, I forgot about a few in my humidor for a while and accidentally aged them for about 5 years and they turned into some of the smoothest and most fantastic cigars I've ever smoked. Now I buy a couple boxes every year and just set one aside just to age them. I have to confess that I am usually not a fan of large ring gauge cigars. 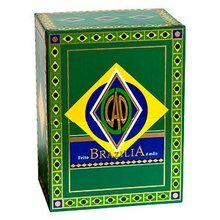 But because I really like the CAO Brazilia GOL, I figured I'd give the Amazon a try. I love it. It's even better than the GOL. But be prepared for a smoke that lasts almost 2 hours. For me, that's perfect. Full bodied, good smoke. Good taste, good draw and even burn. Construction was good. CAO fan and this was typical of their quality. Not a bad cigar, for the money. The five that I had was good down to the last inch. I normally smoke CAO Golds but this turned out to be a really good smoke. The draw on the 2nd half was a bit strong but overall, a good smoke. It's CAO enough said !!!!!! Always the best for the money. Carmel and soft coco! Good stuff! Sometimes runs to one side. But I get impatient! Dont always wait to be completely humidified! 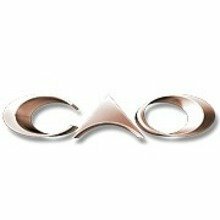 CAO has some fantastic blends coming around the last 5 years. This is one of the best creamy tasty sticks. Good full body cigar. Plenty of smoke but a bit harsh for me. Still not a bad smoke at a reasonable price. Such a nice consistent cigar. I love these! Wonderful construction with ample flavor! I'll order these when needed. just tried it and it has rich bold taste , gonna be one of my favorite cigars.